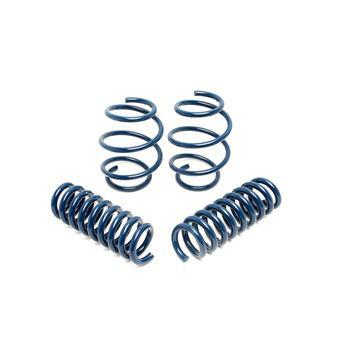 Dinan’s Performance Spring set for the F13 650i provides greater control over body roll by virtue of carefully calibrated spring rates. Additionally, Dinan lowers the vehicle by a 1/2” in front and 1/2” in the rear for improved suspension geometry and an even more aggressive stance. The Dinan springs are CNC wound with high tensile chrome silicon wire and shot peened for stress relief to last the life of the car. The increase in stiffness of the springs will reduce the rear suspension compression under acceleration and front suspension compression (or dive) under braking, giving your car a more controlled feel. The Dinan performance springs will also provide a noticeable improvement in grip, for high speed driving situations that will inspire confidence in your car’s capabilities. The reduced body roll makes the steering more responsive to driver input and will be noticed at low speeds up to the top speed of the vehicle.